Loraine-"Dale" Hall began her career as a licensed esthetician, providing excellent skincare and cosmetic tattooing in the North County area of San Diego under the direction of a renowned plastic surgeon and dermatologist. Dale soon discovered her desire to fill a void within the spa industry by creating a center that not only provided first-class, professional service and treatments, but also did so within a fun, friendly and relationship-driven environment. 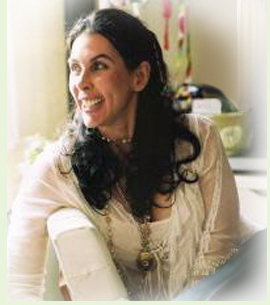 In February 2004, she opened spaViolet - a spa for serious skincare and serious fun. Dale is highly regarded by many local and regional plastic surgeons, dermatologists and professionals in the health, medical and beauty industries for her work as a specialist in paramedical esthetician procedures. She is also continually sought-after by clients for her meticulous, no-nonsense approach to skincare and her ability to develop custom regimens that work. Dale's client relationships are solid gold because she tells it like it is, while nurturing them through the process. Since 1992, Dale has utilized her tattooing skills for such worthy causes as Fresh Start Surgical Gifts, DOCS and has donated her talents to tattooing areola re-pigmentation for breast cancer survivors and reconstructive tattooing for burn survivors and alopecians. Because of her close attention to detail and unique expertise in this area, Dale is able to assure clients that "no one will ever know you are tattooed unless you tell them." She also offers 20 percent off all services for cancer survivors. Additionally, Dale has a niche specialty in permanent makeup, also known as cosmetic tattooing. This technique of cosmetic enhancement includes the permanent tattooing of eyebrows, eyeliner, and re-pigmentation of the skin. Dale attended the University of California in San Diego and later became a graduate of Palomar Institute of Cosmetology. 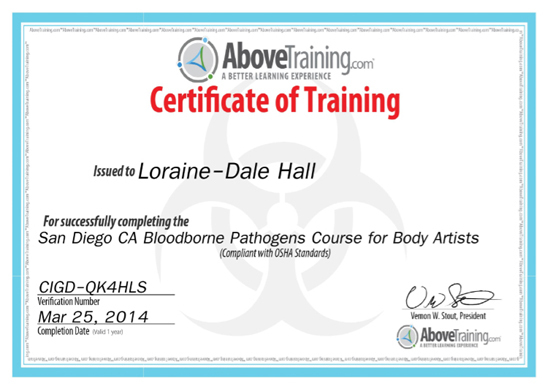 Aside from licenses and certifications from the AIPCT, SPCP, AAM, DAAM, NANTR and Certification in Blood Born Pathogens, Dale has advanced skin care training in permanent makeup color theory through the AIPCT, apprenticed with tattoo artists in Los Angeles, CA and Florida and has advanced skin care through Physician's Choice of Arizona ( PCA ), Dermegenesis, Skinceuticals, Dermese, Dermalogica and Revision. She also co-owns an on line skin care site www.shopspaViolet.com. - Article of Loraine-Dale Hall in Biz San Diego Magazine. 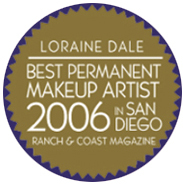 Loraine-Dale Hall was awarded Best Permanent Makeup Artist in San Diego in the Ranch and Coast Magazine in 2006. This was the last year the magazine recognized the category. 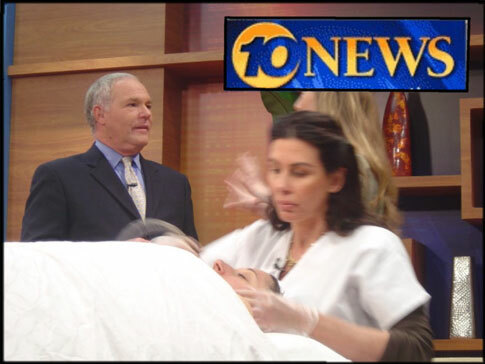 Loraine-Dale Hall shows in a community spot with ABC 10 News in San Diego a procedure in Permanent Makeup and gives information about the procedure. Dale changed my life for the better. C.J. Dale tattooed my eyebrows, did a wonderful job, love the way they look. Two ladies I work with have been to Dale for eyebrow tattoo and they both look great. I went on their recommendation and was not disappointed. Dale took here time and they came out perfect. I've seen some scary eyebrow "jobs" mine are fantastic, why did I wait so long........ R.U. I saw from the pictures in her portfolio, her eyebrow work was sensational. Individual brush strokes, beautiful artistic talent, an eye for what shape goes with what face. I was so happy to finally be in the right place. Dale applied temporary shapes for me to see, so that I could first see the finished result. She is amazing, talented and truly knows her work as the best Ive ever seen. A few hours later, I was so happy I cried on the way home. I have the most beautiful brows which emulate 2 of my six daughters' natural brows. IF YOU WANT PERMANENT MAKEUP, THIS IS YOUR PLACE. I COULD NOT BE HAPPIER. Dale, you are amazing, awesome artistic talent! I love your work, love what you did for me and will be back and giving gifts to my daughters when they ask! I will forever refer you. G.L. Dale has great technique and spent a lot of time ensuring that my brows were perfect! Dale did permanent makeup on my eyes and i love it, Dale is by far the best in San Diego County for permanent makeup! M.B. I have done business with Spa Violet for over 5 years and recently had Dale tattoo my eyebrows and eyelids. Several people in the biz have carefully examined the work and said it was the some of the best they had seen. J.H. Dale recently tattooed my eyebrows which were getting quite thin and sparse, she had first done them about 10 years ago and I had waited way too long to get a re-touch. I love what she did and somehow she managed to make me look younger, as if I'd had a subtle brow lift! My hairdresser noticed and was incredibly impresssed. The process wasn't painful because Dale applied a topical antisthetic throughout the tattooing, in fact I barely felt it. C. J. Last week Dale at Spa Violet tattoed my eyebrows, I couldn't be happier with the results! My eyebrows are perfect, it gave my face an instant lift. I had an appointment the next day at a plastic surgeons office and his staff was amazed too - when a cosmetic surgeon and his staff raves and asks for referral's it's the ultimate compliment! The procedure took about 3 hours and was painless, Dale uses great numbing products and is a cosumate pro. I found it extreemly relaxing! I wish I had done this years ago!!! B.H. If you are considering permanent make-up then you must visit Dale Hall the owner and esthetician extraordinaire at spa Violet. She is incredibly talented and truly an artist when it comes to permanent make-up. She worked her magic on my eyes and now I wake up with perfect eye-liner. It looks very natural and soft. S.N.